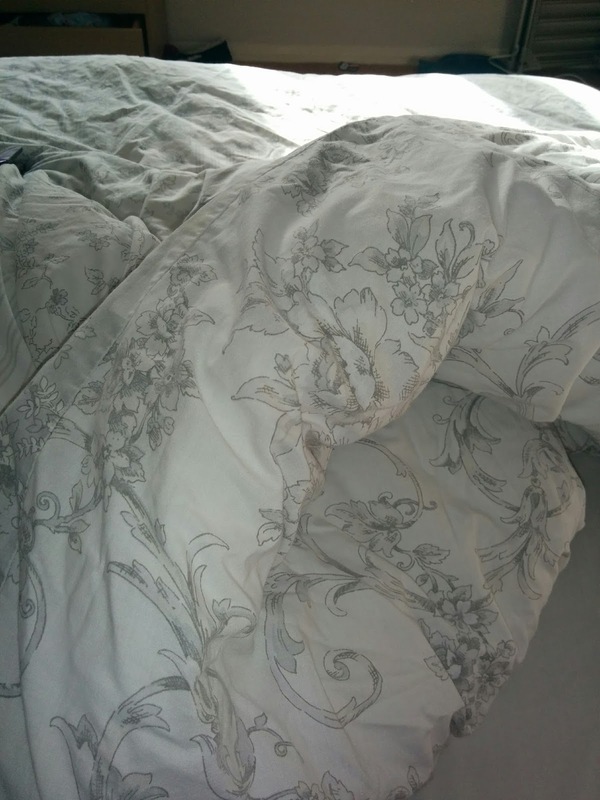 My kind of Sunday – Where Is My Teaspoon? 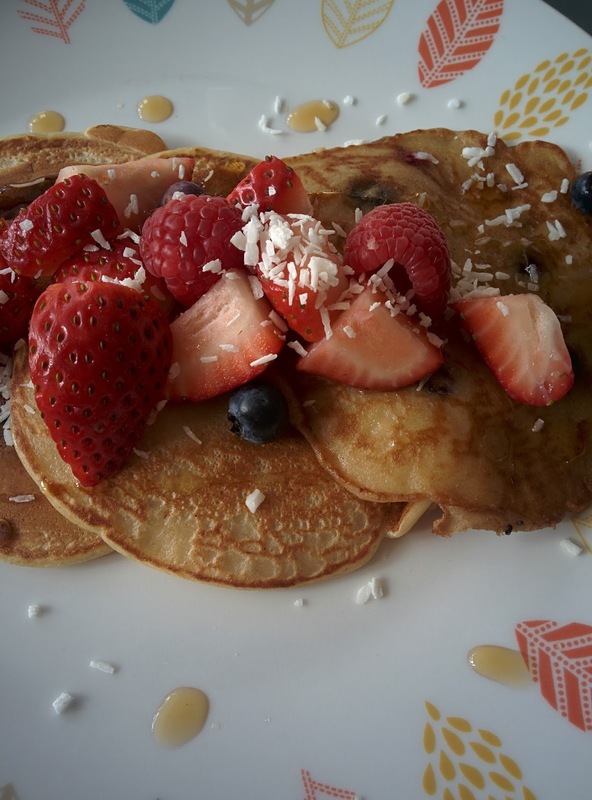 As Shrove or Pancake Tuesday is also this week, it couldn’t hurt to get a bit of practice in! This is my go to recipe and is the one I always make when people come to stay. I normally serve my pancakes with bananas and bacon (don’t say that’s weird) but today went for bananas and mixed berries instead. This week we are going to have pancakes at work and my boss said she will bring in a hot plate so we can make them fresh – talk about a dream work day! Think it’ll have to be a Nutella day 🙂 I can’t really think of anything nicer to push us through the 3pm slump! Sieve the flour into a bowl and add the wet ingredients. Whisk until all lumps have been removed and you are confident it is a smooth batter. Add the mashed up banana and whisk again until fully incorporated. Heat your frying pan – it needs to be hot hot hot before you start. Add a knob of butter to the hot pan and swirl it around. I use salted butter as I love the combination of sweet and salt. If you don’t, just use unsalted or even Coconut Oil would be great here. Add half a ladle of your batter to the pan slowly. Try and keep the shape as round as possible. I find adding banana to the batter makes it harder to get a perfect circle but nothing so yum needs to look perfect anyway. 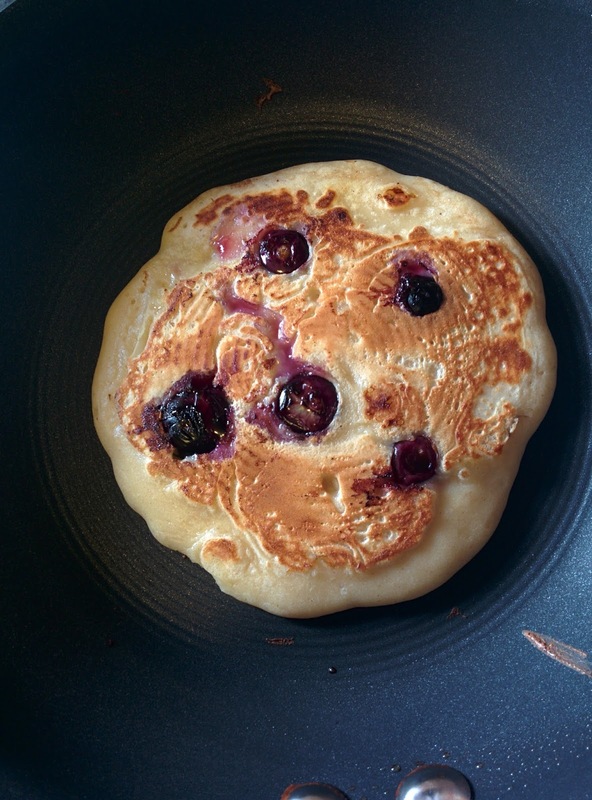 If you want to make blueberry pancakes, add 5 blueberries to the pancake now – mind you don’t burn your fingers, just drop them down onto the pancake. Flip the pancake once it has set and cook for about 3 minutes or so, flipping back and forth so it doesn’t burn. You want the pancakes to be a nice golden brown colour and the blueberries should burst and look like pockets of jam. As I like to make a stack, I usually transfer any cooked pancakes into a lowly heated oven to keep warm. Top tip! After you have made a couple of pancakes, it is normal for the pan to get a little bit smoky. To help this, get some kitchen roll and wipe away any leftover butter which may have over heated from time to time. This also will help your pancakes not to burn as any new butter you add will melt nicely again. 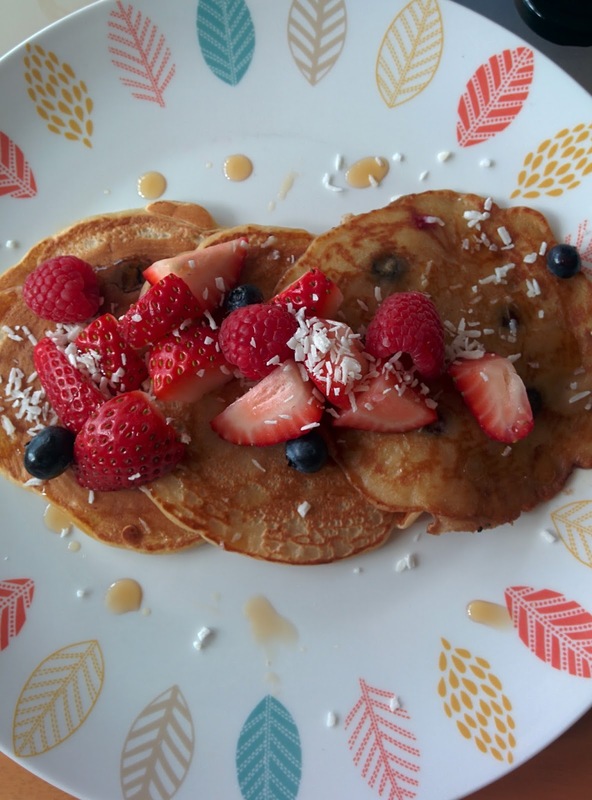 To serve my pancakes I use desiccated coconut, maple syrup and yet more berries. You’ll notice I haven’t add any sugar to the actual batter. I think the banana and berries make it sweet enough and only add a touch of maple syrup to finish. If you’d prefer to add some sugar to the batter, I would add 25g into the flour and mix before adding the rest of the wet ingredients. Wash down with a nice mug of coffee and then get back to bed. Yes please! If you’ve got a good pancake recipe, link me up! I’m always looking for new ones.